The EOS 5D Mark II features a huge, full-frame sensor. 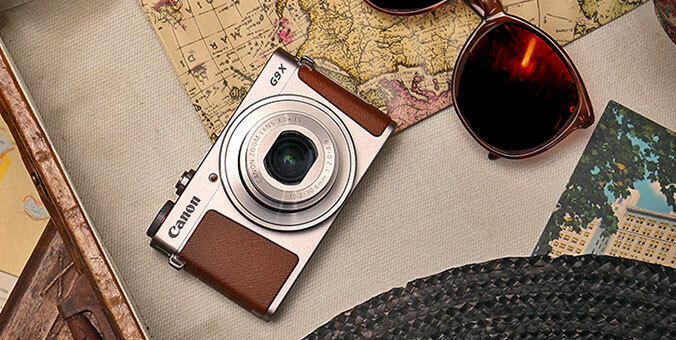 A 21.1-megapixel CMOS sensor delivers images of up to 5616 x 3744 pixels. And since it is full-frame, all lenses will deliver the angle of view they would on a 35mm camera without a conversion factor. This comes in handy especially when shooting with wide-angle lenses. For the flexibility to shoot in even the most dimly lit situations, the EOS 5D Mark II offers Canon's highest ISO sensitivity to date, ranging from 100-6400 (expandable to ISO L: 50, H1: 12800 and H2: 25600). Thanks to improved noise reduction technologies, images shot even at highest sensitivity will be remarkably smooth. HD Video Shooting with Manual Exposure Control. The EOS 5D Mark II is the first digital EOS camera to offer recording of Full HD video in Live View Mode. Capable of shooting clips almost half an hour long at full 1080p resolution, the EOS 5D Mark II does amazing double duty, making it possible to shoot broadcast quality video on your camera by simply changing settings. The advantages move way beyond the ability to shoot on your SLR - the wealth of high-speed lenses and shooting accessories that make EOS photography so remarkable can be used in shooting video. Where interchangeable lens video cameras cost thousands of dollars, with the EOS 5D Mark II their operation, including HDMI output, is simply an added bonus to a remarkable camera. The EOS 5D Mark II's sensor is backed up by Canon's DIGIC 4 Image Processor, which speeds up all operations making a number of new features possible. Processor intensive operations like Face Detection Live mode, HD video recording and lighting and lens peripheral optimization are all possible thanks to the DIGIC 4 Image Processor. 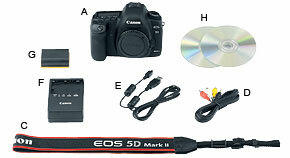 The EOS 5D Mark II also offers full 14-bit A/D conversion. The analog output from the image sensor is converted into a digital signal via 14-bit conversion instead of the previously used 12-bit conversion, resulting in significantly finer tonal gradation for better prints. The EOS 5D Mark II has a sophisticated AF system consisting of 9 user-selectable AF points, along with a total of 6 additional vertical and horizontal AF assist points. The central AF point is cross-type, and is sensitive to vertical lines at an aperture of f/2.8, horizontal lines at f/5.6. The AF system is also sensitive to its light source, and can compensate for focus errors that can occur when multiple sources illuminate a scene. AF points can be chosen by the photographer using the 5D's multi-controller or preferred control dial. Plus, the EOS 5D features a dedicated AF ON button. The EOS 5D Mark II has an all-new 3.0-inch Clear View LCD that features high-resolution 920,000 dots/VGA for far more detail than any previous EOS Digital LCD. A number of new features enhance usability: a new anti-reflection and water-repellant coating provides a clearer and more smudge-resistant surface and a light sensor mounted below the screen enables automatic brightness adjustment in accordance with ambient light. Vertical-travel, mechanical, Electronically-controlled, focal-plane shutter	1/8000 to 1/60 sec., X-sync at 1/200 sec.